Central Library started functioning since 3rd October 2012 under the Chairmanship of Dr. Pranati Nanda, Additional Prof. Department of Physiology whose painstaking effort saw the library grow by leaps and bounds. Presently, the library is being headed by Prof. (Dr.) A. K. Praharaj, HOD, Department of Microbiology under whose leadership the library is making further progress. It was situated on the ground floor in the Academic Block. It had moved to 2nd floor of Administrative Building on 9th February 2016. 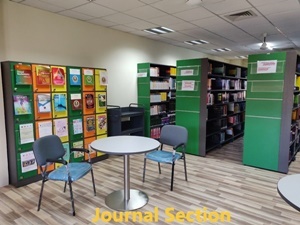 The Library caters to all the faculty members, PG student, MBBS as well as B. Sc. Nursing Student and paramedical courses like OT & AT, Radio Therapy and Medical laboratory. We have 03 functional computers at present with limited Wi-Fi facility. 20 more computers are installed in computer centre. November 2016 we have procured Remote access software for accessing e-resources inside as well as outside the campus purchased by our institute. "Library is automated with Koha integrated library management software and RFID (Radio Frequency Identification) system is implemented for management. The link to Library OPAC (Online Public Access Catalogue) (intranet) is http://10.200.10.150/ "
Faculty members, Students and Staff are entitled for library Membership. They are required to fill a library membership form and submit the same in the library. The library membership forms can be obtained from library as well as from library website. All the members can activate their account as soon as they get their Smart Card.